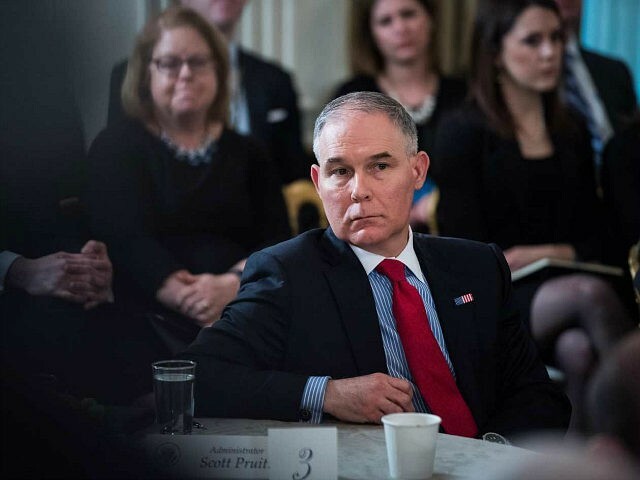 The Environmental Protection Agency (EPA) is hitting back following attacks on Administrator Scott Pruitt concerning his housing arrangements in Washington, DC, being an unethical gift from a lobbyist. Kevin Minoli, designated agency ethics official and principal deputy general counsel for the agency, issued a memorandum and a statement on Wednesday. The Washington Post has led much of the media criticism on Pruitt’s housing arrangements and travel, raising ethical concerns about both. The Post reported that Pruitt “complained” about its inquiry about his housing situation in an interview Wednesday with The Washington Times. Pruitt explained his reasons for spending time away from Washington on official business and time spent at his Tulsa, Oklahoma, home following knee surgery after the Post speculated about his absence and where he has traveled and lived since President Donald Trump nominated him to head the agency. In recent weeks, Pruitt has been dogged by revelations that he took dozens of first-class flights during his government travels, which EPA officials have argued was necessary due to security concerns, as well as by the disclosure of a housing agreement he struck during his early months in Washington with the wife of a lobbyist he knew from Oklahoma. Under that arrangement, Pruitt paid for a room in the condo a block from the Capitol but only paid for the nights he stayed. Both his living and travel arrangements have drawn inquiries from lawmakers and government investigators. The memorandum concluded, after considering the factual record, that the use of property authorized by the terms of the lease would not constitute a gift. Individuals have noted that the Review uses the words “did not” constitute a gift instead of “would not” constitute at gift, and understood that language to imply that the Review had evaluated the actual use that occurred; to be clear, despite the use of the words “did not,” the Review only addressed the term of the lease as written. Wednesday’s memo also includes copies of online searches for properties on Capitol Hill. The Post noted in its coverage of Pruitt’s interview with the Times what some are saying about Pruitt’s success in putting the president’s deregulatory agenda in place in an agency with a history of environmental activism. “Pruitt dismissed the recent attention on his ethics decisions as ‘a distraction’ from critics trying to undermine the effective job he has done rolling back Obama-era regulations,” the Post reported. “It’s been noisy and competitive since day one because this agency has been a bastion of liberalism since day one,” Pruitt said.